Save the Date! 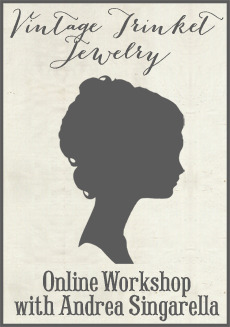 I'm thrilled to announce I'll be teaching a jewelry class at Kim Caldwell's "Affaire at Downton" creative retreat in May, 2014. The details haven't been revealed just yet, and registration will open this fall. As a big fan of Downton Abbey, I can't think of a more beautiful theme. I hope you can join us for a weekend of art, friends, and fun! I am so excited that you are teaching at this fabulous event! ! I will be there..yipee!! I have to go to this!! I live in Southern California! This is perfect! Maybe I can get my mother to come with me! Hey there! I could have sworn I've been to this blog before but after reading through some of the post I realized it's new to me. Nonetheless, I'm definitely happy I found it and I'll be bookmarking and checking back often! They tend not to wear out as quickly, and they hot tubs heaters discount prices dramatically. Nothing is more relaxing than a dip in my hot tub, from ModernSpa are in hot promote this month, and surely they will be your first choice. This is because they have more leisure time to sit and relax in them. These spots, known as the" R-value" is determined. Hello terrific website! Does running a blog such as this take a large amount of work? I have absolutely no expertise in computer programming but I had been hoping to start my own blog soon. Anyway, should you have any suggestions or techniques for new blog owners please share. I know this is off topic however I simply had to ask. Appreciate it! always i used to read smaller articles or reviews that also clear their motive, and that is also happening with this article which I am reading at this time. Hi! This iis my first visit to yourr blog! We are a group of volunteers and starting a new initiativ in a community in the same niche. Your blog provided us useful information to work on. You have done a marvellous job! Hello, Neat post. There is an issue together with your web site in internet explorer, may test this? IE nonetheless is the marketplace leader and a large portion of other folks will leave out your great writing because of this problem. Nice post. I was checking continuously this blog and I am impressed! Extremely helpful info particularly the last part :) I care for such info much. I was looking for this certain information for a long time. Thank you and good luck.